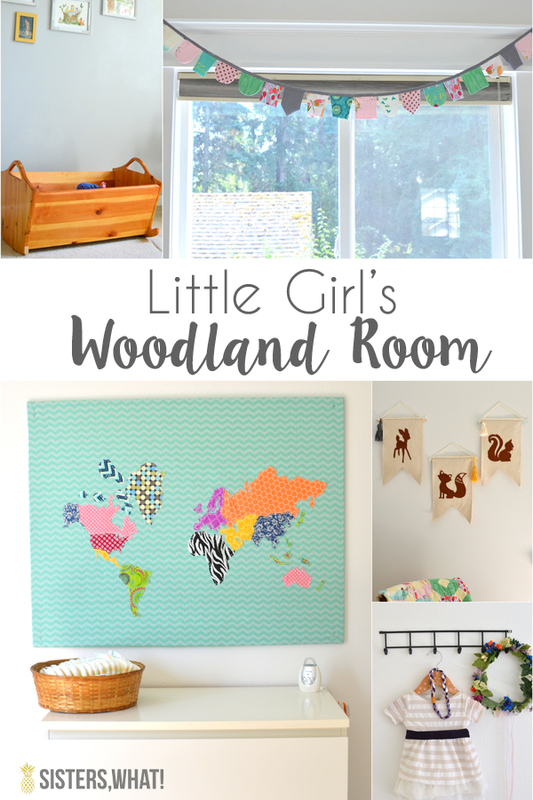 ' DIY Little Girl's Nursery Woodland Room - Sisters, What! 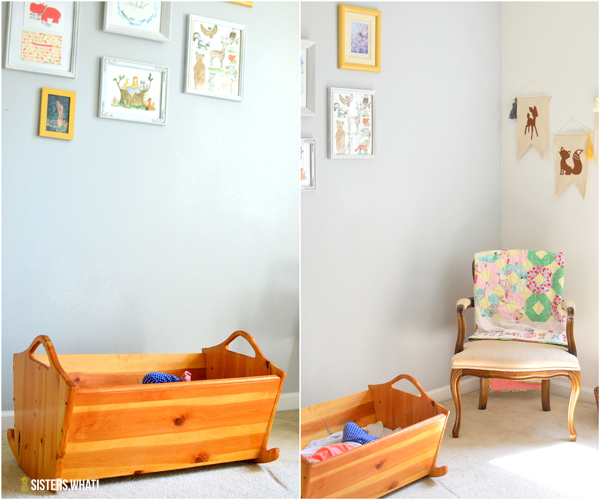 I'm so excited to finally be sharing with you our baby girl's room. 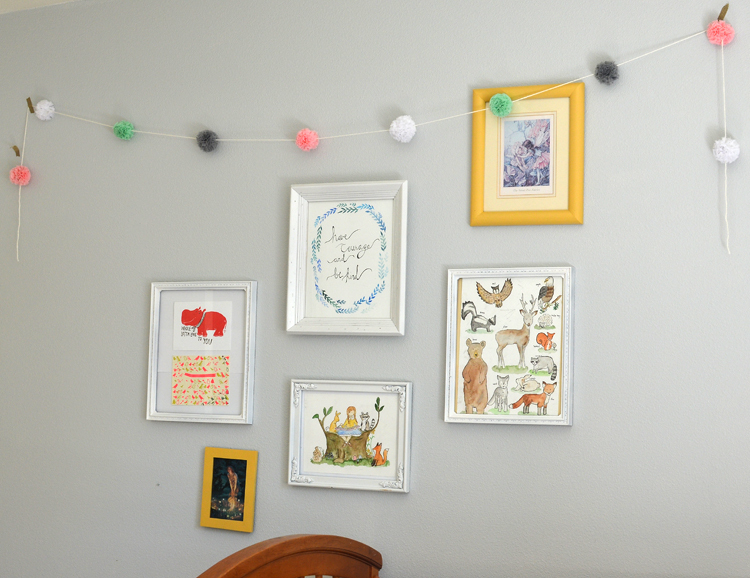 I've never decorated a whole bedroom room before, let alone done a room with a theme, so this was a bit out of my element. I actually wasn't even going to decorate her room, but then my mom gave me a box of some of my old things. In the box there were some fun fairy/woodland art prints (when I was little I was obsessed with fairies) which she had kept all this time. I couldn't believe it. 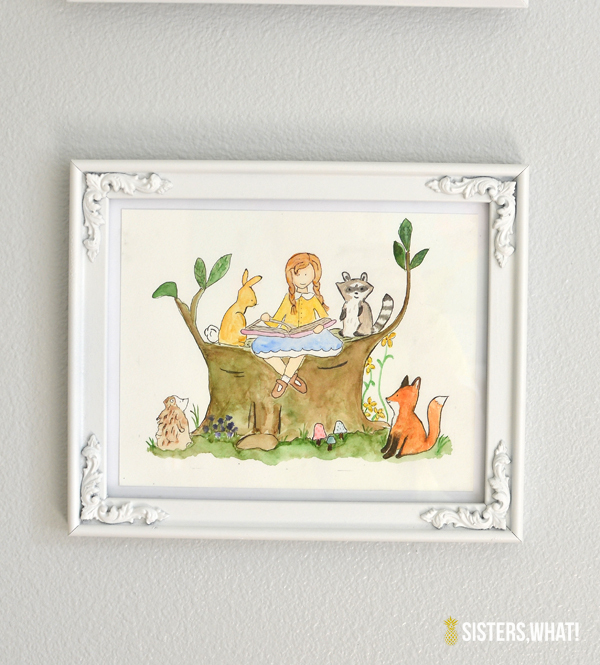 I'm not totally sentimental to many old things of mine, but I decided that they would be perfect in our little girl's room and slowly a little girl's woodland room came together. Just a little warning, this blog post is loaded with TONS of pictures. I hope you enjoy. 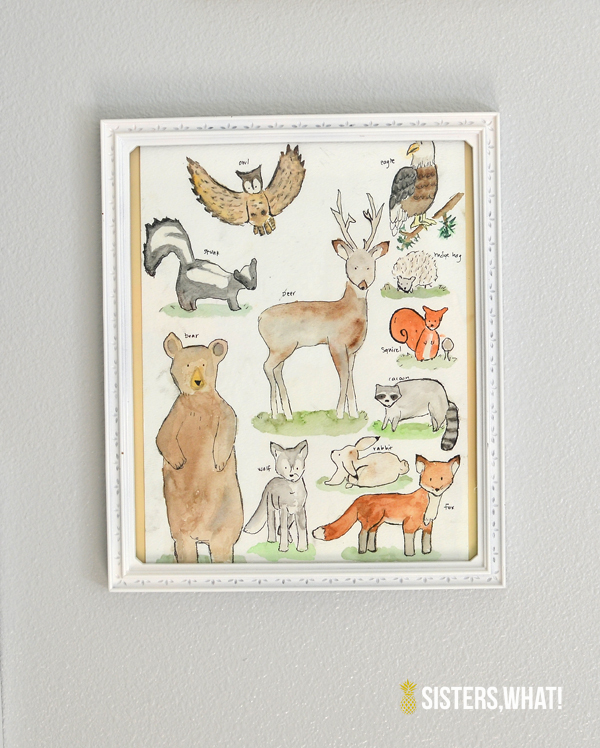 I absolutely love everything about it and I hope our little girl grows to love it too. 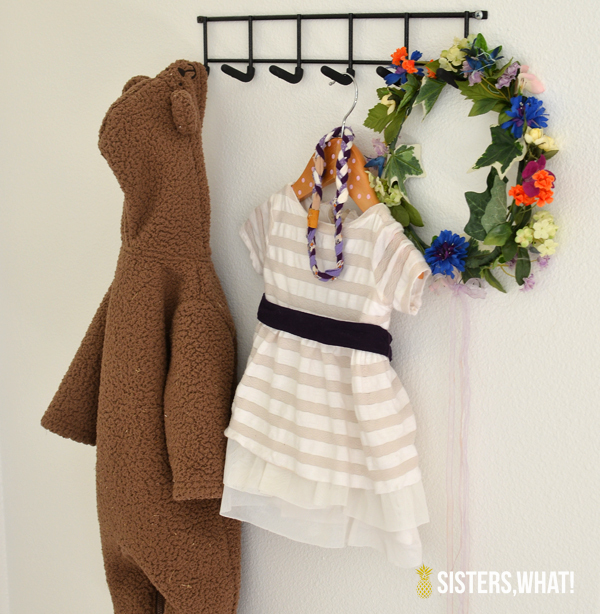 When you walk in, hanging is a little winter bear outfit (perfect for woodland theme isn't it!!) and her blessing dress which I made. One of these days I'll do a tutorial for it. The wreath of flowers is actually from when my older sister got married. I can't believe my mom kept it in a box for all these years. 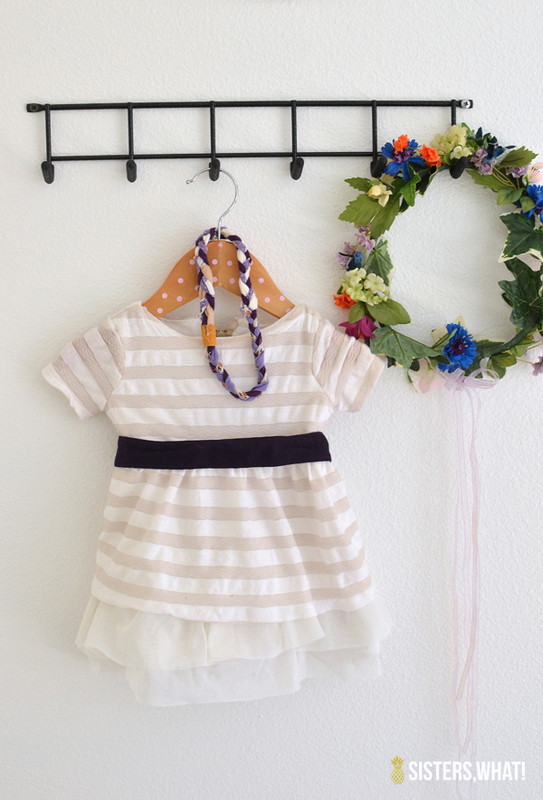 I just love it hanging there and I can't wait for it be used as a dress up. Below was a gift from a friend. 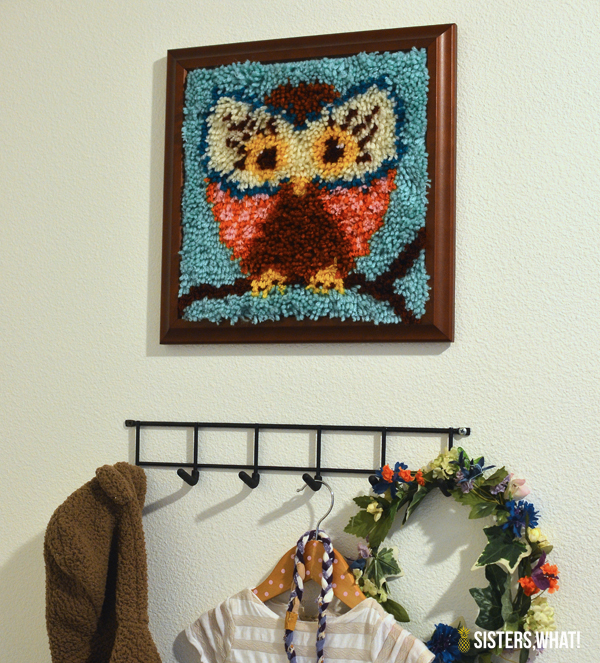 She nailed the colors and the owl is perfect for this room. 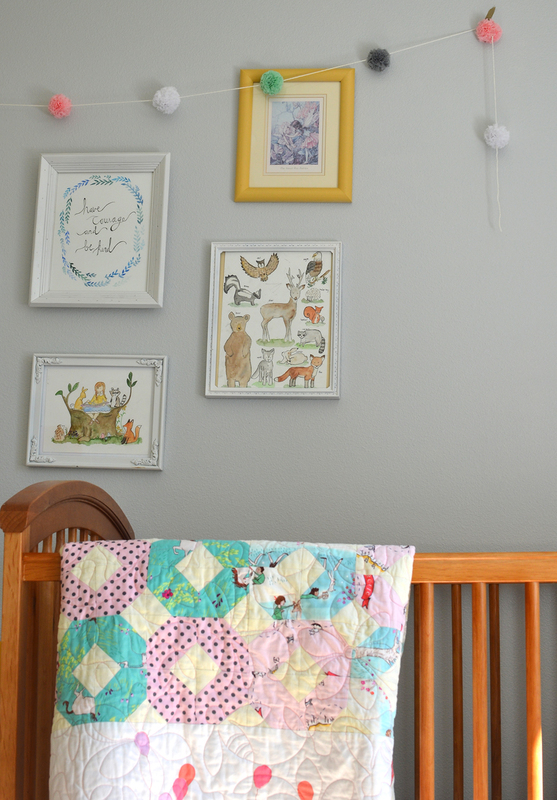 Since our 2 year old was still in his crib when she was born, sweat pea slept in this cradle for the first 5 months (only last week did we make the transition to the crib). 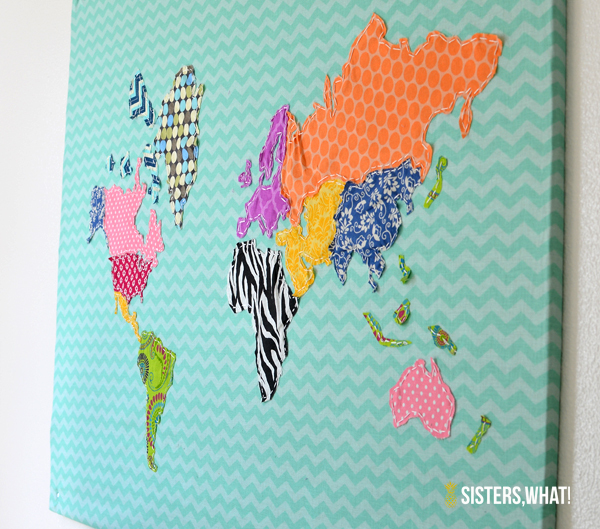 My dad made one for each of us girls and I love that each of our kids have slept in it. The Sweet Pea Fairies by Cicely Mary - another one from my childhood. 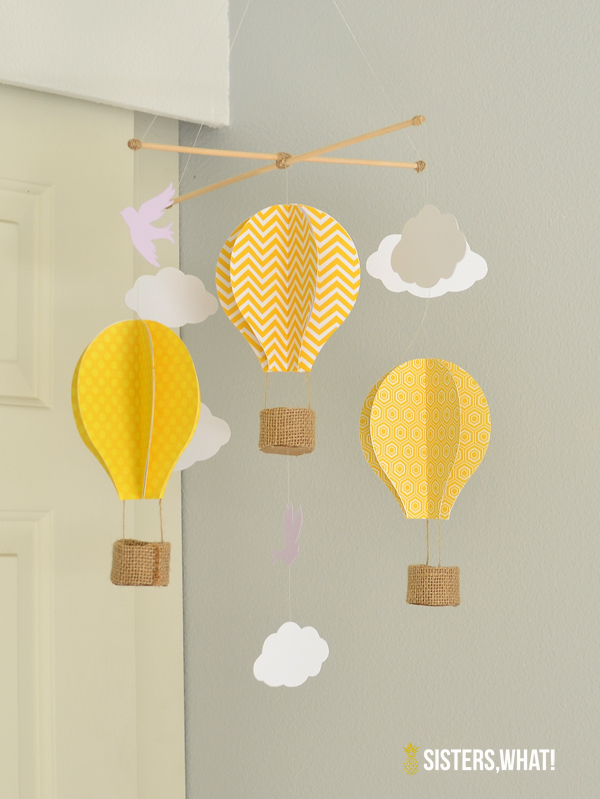 A friend made this cute air balloon mobile for my baby shower. 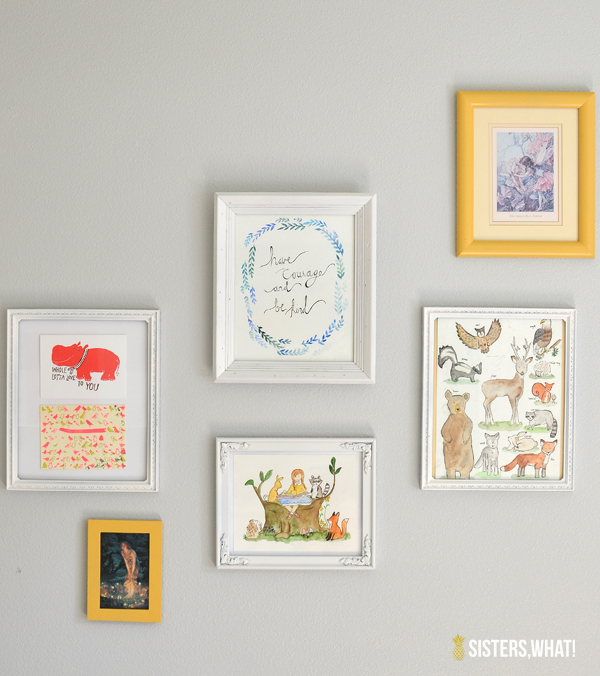 It is the perfect addition to her room. 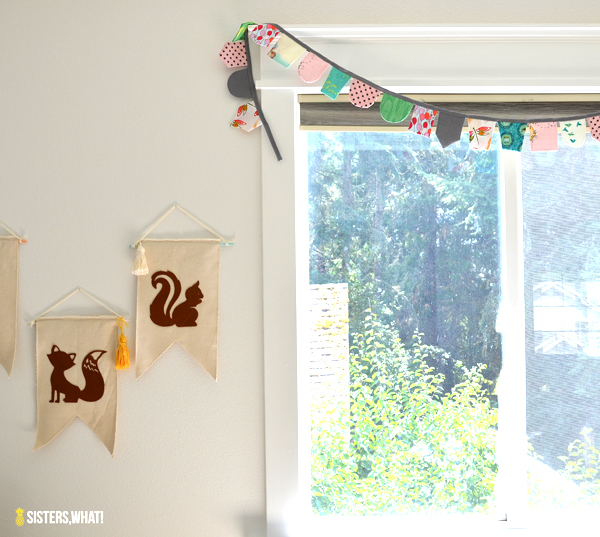 These animal banners are probably my absolute favorite thing in her room. I can't remember how I came up with the idea, but I love them. I was going to cut the animals by hand, but I thought I'd give it a go at cutting the leather with my silhouette. It totally worked!! I can't wait to share the tutorial with you. Stay tuned! 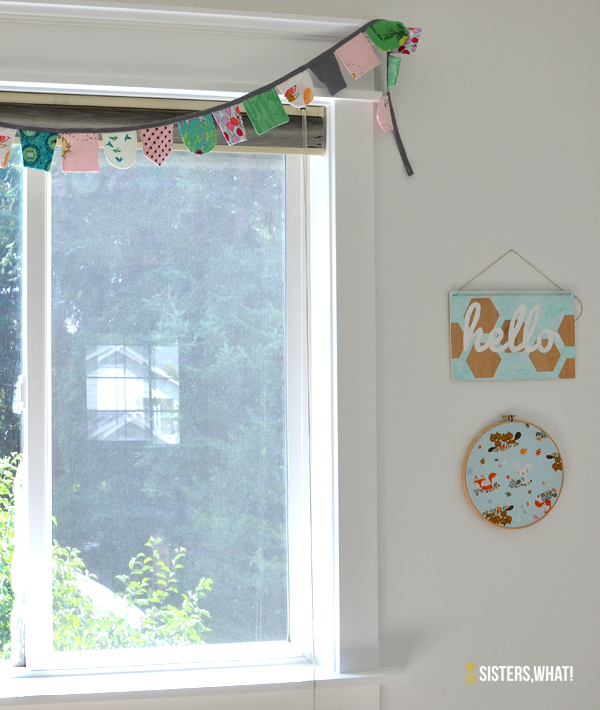 A few months ago I made an hexagon hello sign for a friend and with the vinyl negative I also made one for baby girls room. Below it I decided to put some left over woodland fabric (from a flannel blanket I made for her) in a hoop. 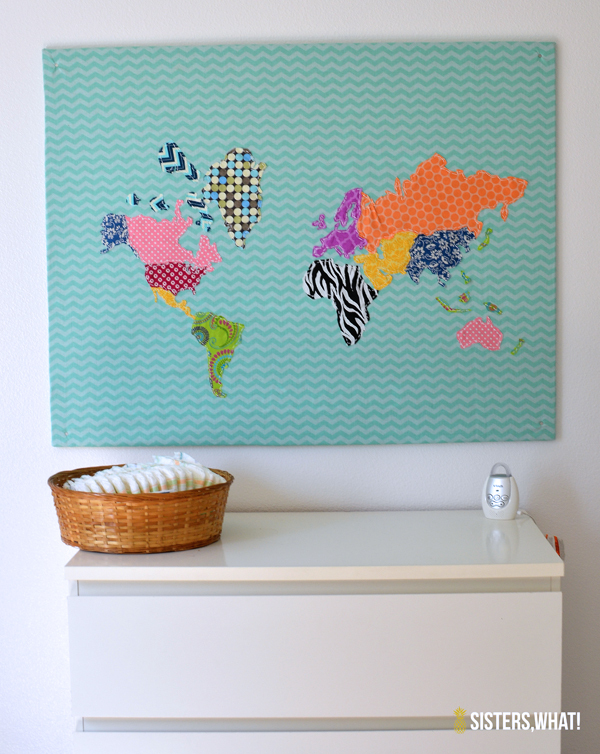 The fabric map art below is my favorite thing in the whole room. This was also made by a friend for my baby shower. She matched her baby blanket, that my mom made, perfectly. Seriously, it's really awesome. 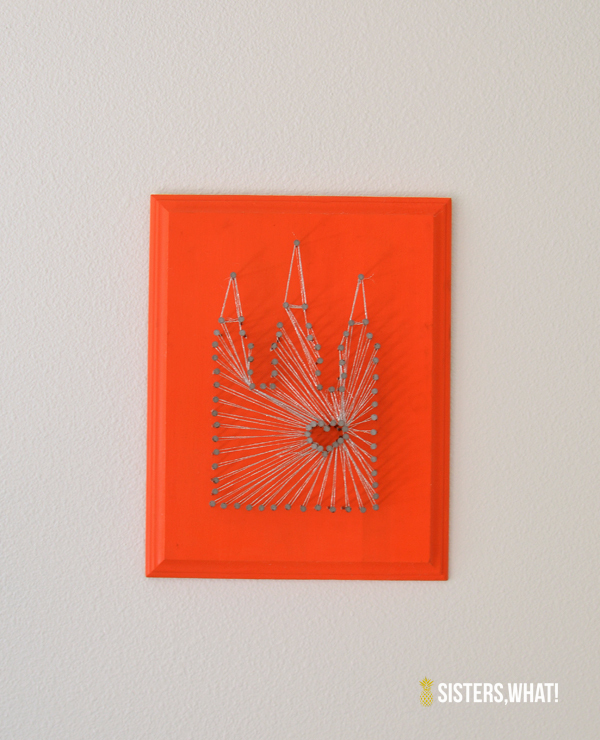 The last thing in her room that we added was this nail Salt Lake City Temple art, made by Sierra. She actually gave it to us for Christmas like 2 years ago but between moving and such I've never had a chance to put it up yet. 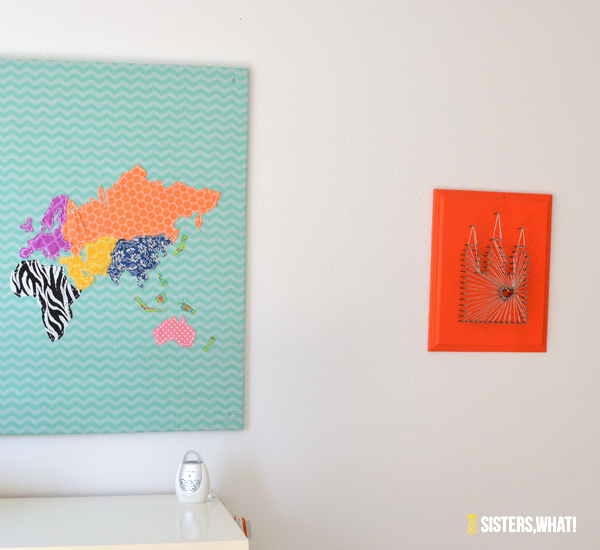 I'm so glad I waited; it goes perfectly in her room. 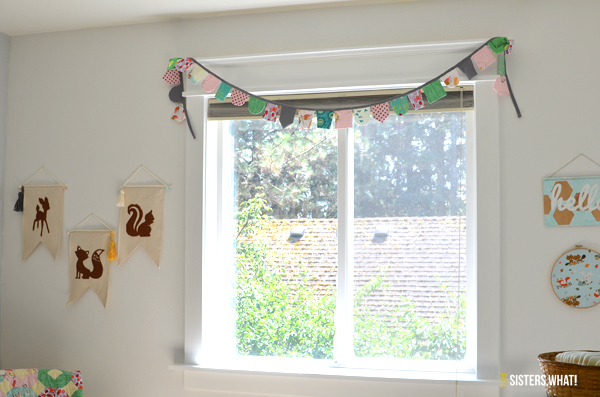 There are still more things I haven't added yet, but I'm just happy we got these things up. Phew...that was a super long post. 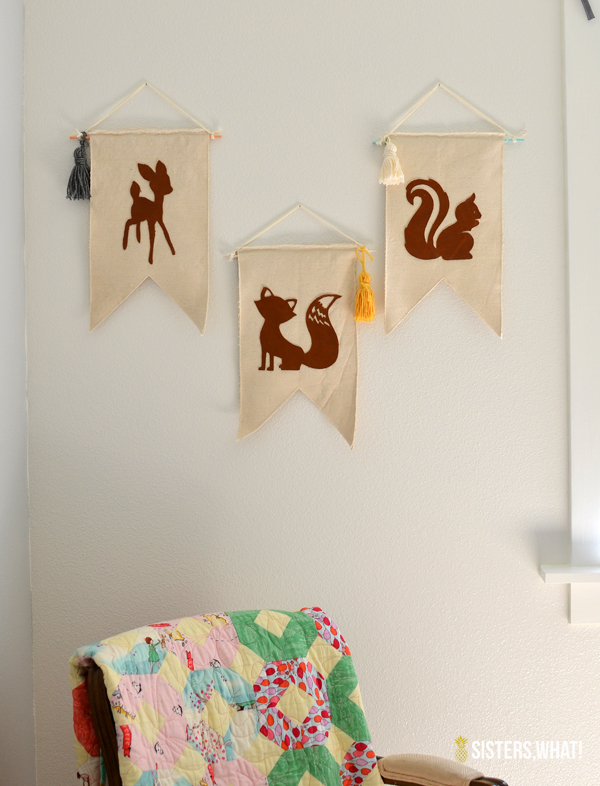 Stay tuned for a how to for the leather animals banners and pennant banner.